Margaret Melinda Harvie 1870-1962 Margaret Melinda Tolmie was born in Ancaster Ontario in 1870. When she was 22 she married Edwin Harvie (my grandfather). When she was a child everyone called her Maggie. Maggie Melinda Custom Miniatures is named in honour of her. She was a suburb needlewoman. 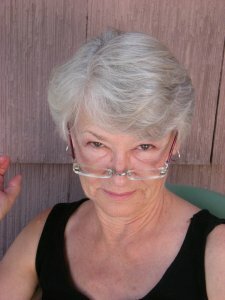 She knitted, crocheted, quilted and made clothing. Crochet was her favourite. She was still going strong on crochet at her Birthday Party to celebrate age 90, as show in the picture of her that ran in the Galt Reporter of August 9,1960. 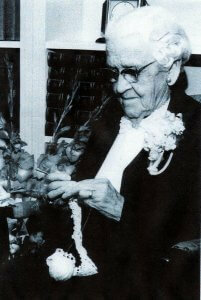 She died in 1962 leaving behind a wealth of quilts, crocheted pillowcase lace, and doilies that I enjoy to this day. It is from her that I acquired her love of fabric and my skill with finely detailed work. I am a recently retired Insurance Professional who has decided to turn my 22 year Hobby into a business. I graduated from Ryerson Polytechnical Institute in Toronto many years ago with a diploma in Fashion Design. I purchased the Hampton House kit for my 8 year old daughter in 1988. I so enjoyed putting the house together- I am proud of it today! It has survived many moves, damp basements and several renovations. Because I blew the entire budget on the house kit, we began with out-of-scale foam-core furniture, curtains that stuck out all over the place and gift-wrap wall paper. We had sooo much fun ! The Hampton House has slowly evolved with the addition of love, time and $$$ into a pretty nice dollhouse.